Today, when a child receives an i-pod for Christmas, there will not likely be an inscription on the case. First, the case wasn't meant for it, and second, there is not enough space for "To Jimmy, Merry Christmas and a Happy New Year, from your Aunt Mavis." But in the old days, when there were books, and there were books as gifts, there was plenty of opportunity on the paste-down or front free endpaper for all the writing you could want, from something terse to an all-out epistle. As well, books leant themselves to annotation. They were about writing anyway, and careful additions by the owners added to the story of the book, so that you can often get an idea of where the book had been, and what its owners had experienced. You have seen many examples, but here are two good ones, both bought at the Longmont Library sale in April. It was the last day of the sale, which is bag day, and thus time to hit the foreign language boxes. It turns out that they came from the same source. 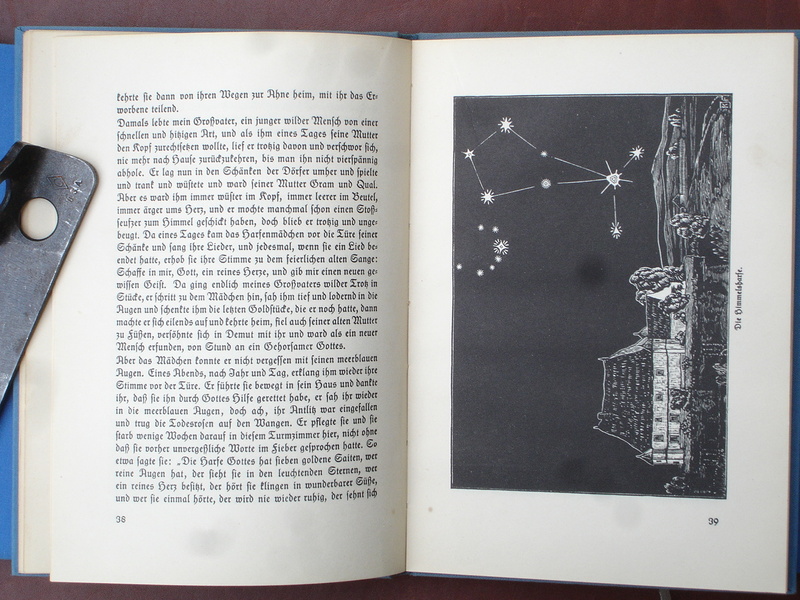 The first is a small handbook on the stars, meant for childen; Mein Sternenpate, oder Sternkunde für Kinder. 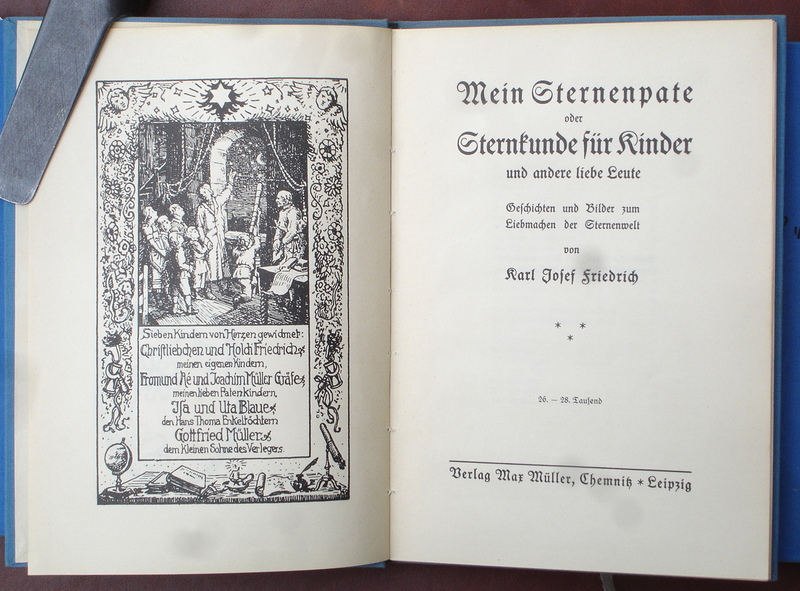 It was written from a Christian point of view by Karl Josef Friedrich, an evangelical minister. He dedicated it to seven children (including his own two) who were especially close, in a delightful frontispiece opposite the title page. Holdi, short for Gotthold, was born in 1921, and his brother Reinherz, who wasn't mentioned because he was born in the year after the book's publication, would both be killed in 1943. Friedrich gave two of his children to a regime that apparently had no use for his values; it censored him. 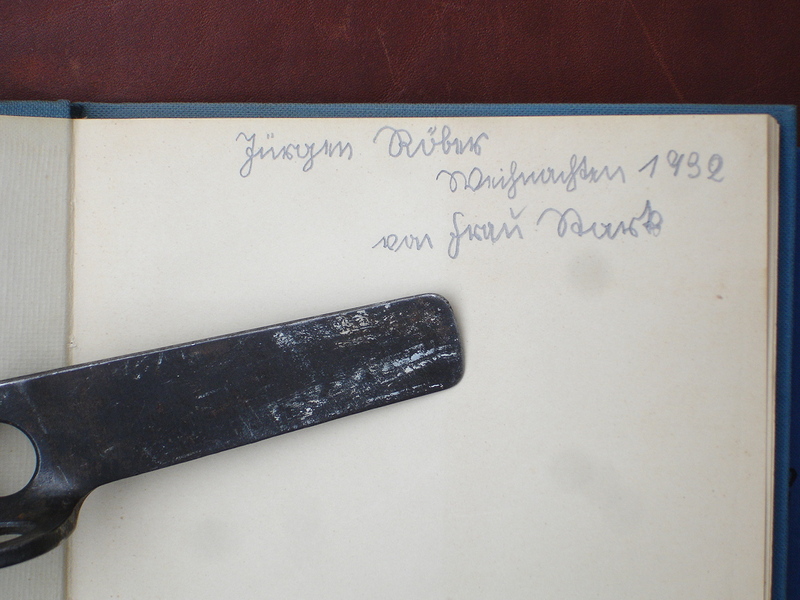 This copy was a gift, and the giver left this dedication, in pencil: "Jürgen Röber/Weihnachten 1932/von frau Stark" The handwriting is in what is called "Sütterlinschrift," a type of cursive writing based on earlier styles but that became formalized in the early 20th century. It takes some getting used to, but once you do, it is enjoyable, and it gives you access to many letters and other communications written during the period. I suspect that Jürgen was a child when he received it; maybe the same age as Gotthold or Reinherz, and I wonder if he survived the war. 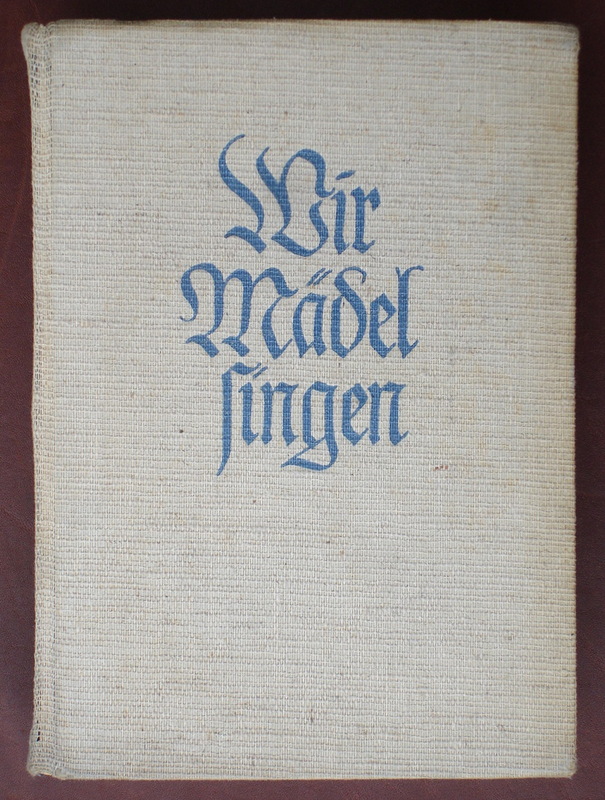 The second book was given to whom I believe was Jürgen's sister, Hannelore, six years later. 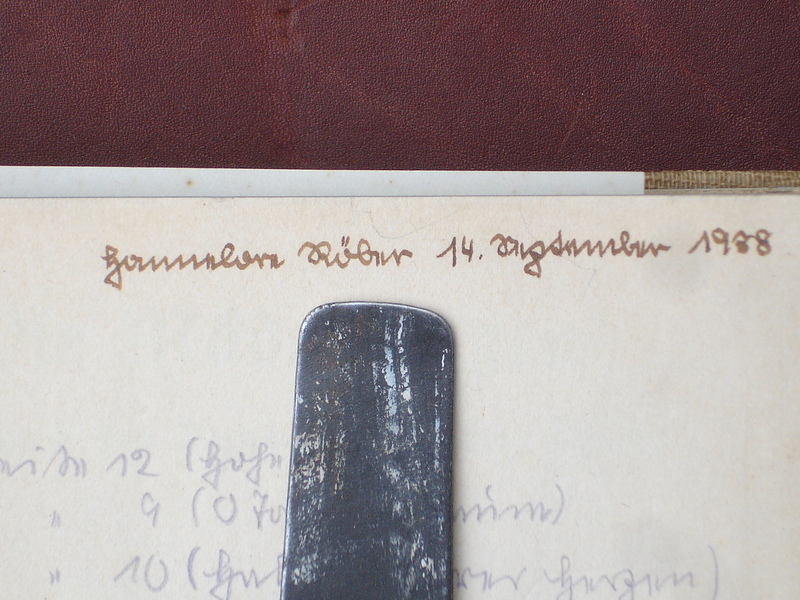 In this book the inscription reads "Hannelore Röber 14 September 1938." The title is Wir Mädel Singen, a book of lyrics and music, to which are added various inspirational quotes from famous leaders of the time. 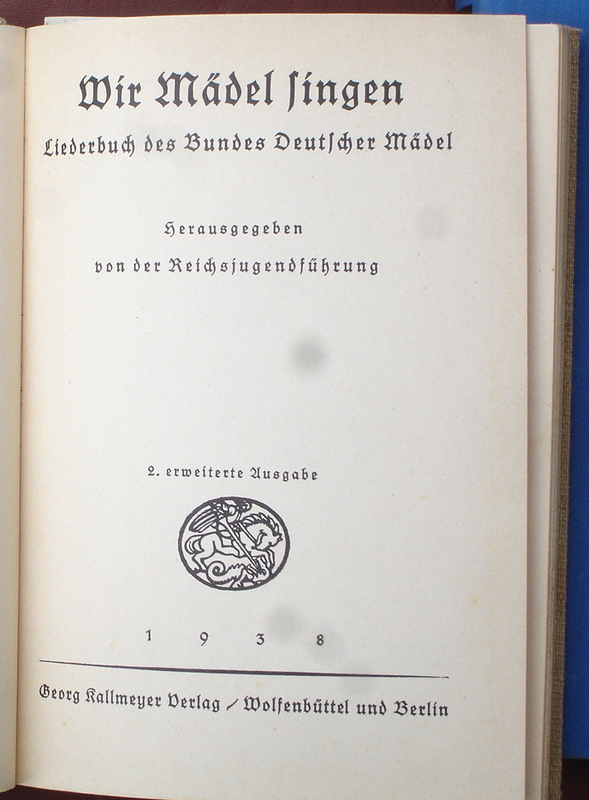 It had a subtitle, too: Liederbuch des Bundes deutscher Mädel. The Bund deutscher Mädel, or BdM for short, was for the girls, because the boys got to join the Hitlerjugend and sing their own songs. So, it came from a world view opposite that of Friedrich's . Hannelore, being thirteen on that date (it was her birthday as it turns out) would have been a member, possibly since she had been ten. It would have not necessarily been her or her parents' choice; if you were a German boy or girl of the right age it was obligatory to join either the BdM or the HJ. 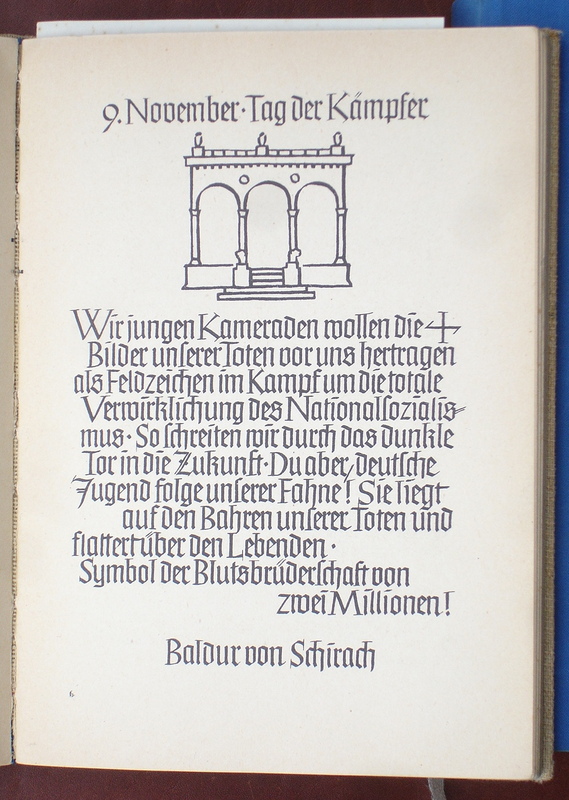 The lyrics, about nature, homeland, patriotism, etc., are punctuated by quotes largely by Adolf Hitler and Baldur von Schirach, and you can see two of those on the right. Returning to the date, we can speculate a little about the times; the Munich agreement was about two weeks in the future. Just shy of a year later, was the beginning of the war, and the end of a world. 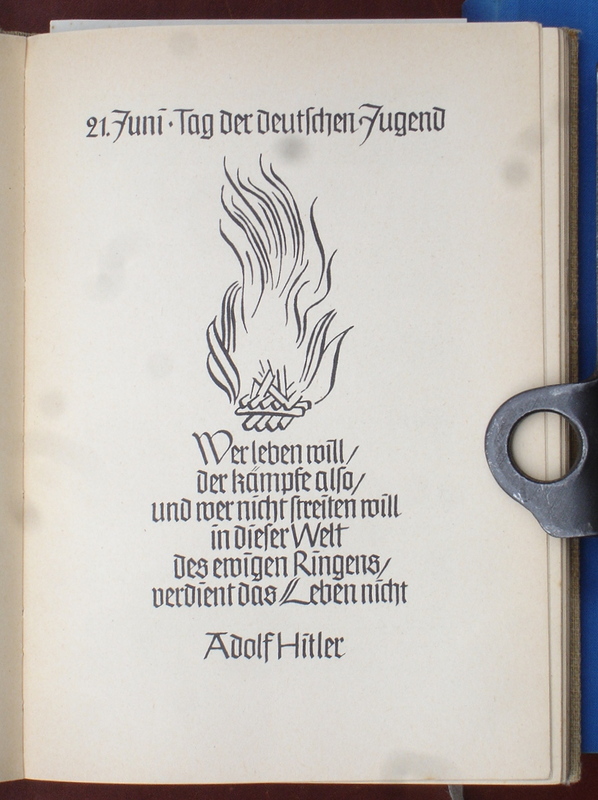 So here is a book with a little girl's name on it, and a date indicating that her country is about to drive off a cliff with the rest of Europe in the back seat. Did she make it? Yes! While I don't know about Jürgen's fate, I do know that Hannelore survived; her obituary, dated July 6, 2003, stated that she had died on July 1. That was in Longmont, and her last name was Storz since she had married Johannes Storz in 1959 after moving from Germany. They both did veterinary science, and were active at three universities, and with having three children, before moving to Longmont in 2002. How did the two books come to Longmont? Did she bring them or did a relative send them to her? I don't know, but I'm relieved that she got through. And that the books had those names and dates.